As the technology advanced, many people are begin to demand for more advanced products. This also happened in the market of video recording device, being marketed to ends consumers, both Panasonic HC-X1000 and Sony FDR-AX100 fall into the mid-range category and of course with more affordable price compare to professional camera. If you are looking for a video recorder that able to take 4K video and comes in an affordable price, you should read this article. 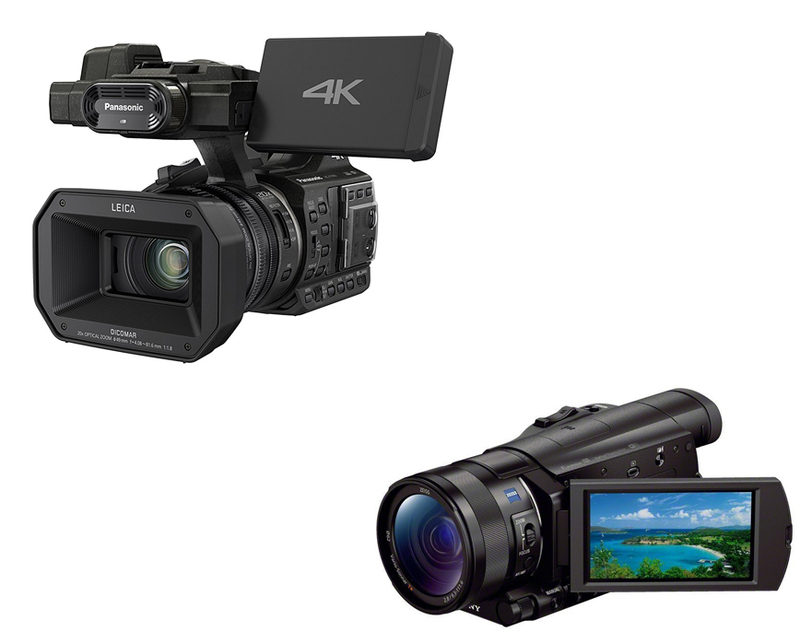 Panasonic HC X1000 is a 4K DCI/Ultra HD/Full HD Camcorder. This camera is able to shoots and records cinema 4K at true 24p, and UHD at broadcast compatible frame rates, this camera will able to fit the video smoothly to your existing broadcast workflow. This video recorder is capable of taking cinema grade 4K footage with resolution of 4096 x 2160 pixels and manage the video resolution at 24fps. If you are interested with other similar product you also can read our other article on Panasonic HC X1000 vs GH5 here. The size of this video recorder is belong in the mid-range that feels compact. The weight is only around 3.5 pounds, this means you will be easily handling this camera with one hand and even the most of its built is made out of plastic, it doesn’t feel cheap of flimsy at all. Taken from Panasonic site, the HC-X1000 has a standard grip configuration: a handgrip on the right and an overhead handle, moreover both of them has their own record buttons and zoom rockers. The rest of the controls are placed on the left side, this includes neutral density filters, audio controls and SD access. You can also find the adjustment rings on the lens barrel control focus, zoom and iris, but this control is inaccessible from the right side and at the top of the unit. From the hardware view this camera has two SD card slots, one 3.5 inch LCD, and a 20X zoom lens with a 3 stop ND filter. For the audio input the HC-x1000 has a built in two channel stereo microphone, and also a headphone jack. When you already record your video, you can output it using the HDMI port. This camera also powered by 12V DC input that you can use to run the camera or charge the battery. If you want to save your video, you can use the dual SD card slots using the MPEG-4/H.264 compression. This compression will lets you view the video in almost every computer available these days, so it will make editing video more convenience. The camera performance is really good, the autofocus is responsive in a full wide shooting. The optical image stabilization system is also good, when tried shooting a video of distant fishing boat without stabilization produced barely usable jittery handheld shots. But when using stabilization, the image is smooth enough to see the distant fishermen throwing their lines. Sony FDR-AX100 is camcorder released by Sony back then in March 2014. This camcorder has a small built, affordable, easy to use, has a large sensor, great lens, and many manual controls. The company itself has been making hand camera since 1985 and keep improving since then. With today technology, they able to make smaller, faster and affordable video recorder. With this FDR-AX100, Sony is bringing 4K resolution into a wider user. This camera is marketed towards consumers, but they offer the features that commonly only available in professional tools. The FDR-AX100 is comfortable to be handheld, the controls and adjustments, such as the controls for taking photo, starting, stopping recording, and focus magnifier are also placed strategically to ease you when using the unit. The LCD panel you can find in this camera has a high resolution and is easy to see even when under sunlight, moreover it is a touchscreen that you can use to navigate the menu system and adjusting the configuration. Sony FDR-AX100 also has a built in 5.1 channel surround microphone, the audio also can be controlled manually, you can reduce wind noise or make the microphone to behave more directional in an attempt to exclude the recorder voice. Similar to HCX1000 mentioned above the FDR-AX100 also has image stabilization, which is used to reduce jitter and vibrations. Another feature is the 1 inch sensor that will help you taking video under low light condition to properly expose the image, but it will also add some noise into the picture. The difference between Panasonic HC-X1000 and Sony FDR -AX100 are, first, the megapixel FDR-AX100 has 14MP, while HC-X1000 has 8.85MP. Second, the HC-X1000 is able to take video at 1080p x 60fps, two times better than FDR-AX100. Third, FDR-AX100 has BSI sensor, while HC-X1000 is not. Fourth the FDR-AX100 has manual gain, while HC-X1000 is not. Fifth, HC-X1000 has manual white balance, while FDR-AX100 is not. When it comes to choosing between both of them, you might also want to consider their price, their price gap is about $100, with HC-X1000 being the pricier, if you only want to take a good quality video while still having a fat wallet, we will recommend you the Sony FDR-AX100.